Suitable placed mobile phones,wallets, keys, tools and other small items. EXCELLENT WATERPROOF PERFORMANCE: Made of super-light 600D TPU material, provides the best waterproof performance to protect your valuables from water, dirt, and dust. Adopts high frequency welding technology, durable, cold-resistant, age-resistant, solid and easy to clean. AERODYNAMICS&ULTRALIGHT：Well designed shape to reduce air resistance to the minimum, for your high speed cycling experience, and this one is much lighter than former edition. 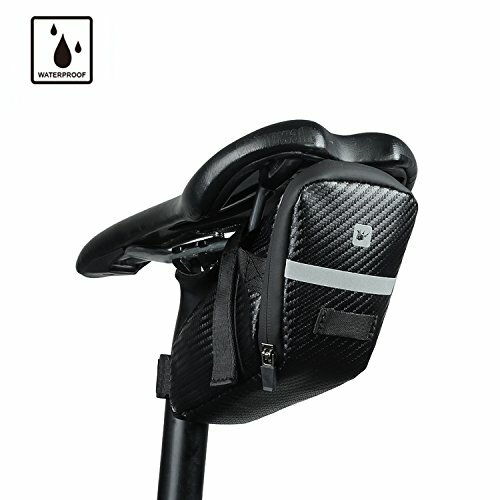 EASY INSTALLATION AND QUICK RELEASE: The sticky loop and hook strap and quick-release buckle help to fix the bag on the saddle rack and seat post easily and firmly, suitable for most types of bicycles. 100% SATISFACTION GUARANTEE: The bag comes with a 100% Satisfaction Guarantee. Rhinowalk is dedicated to address any product/service issues and is committed to delivering a 5 star experience for all customers. STANDARD-SIZE :7.5"×3.3"×3.5" Volume: 1.0 L, 2.78oz.